Shop Geeks online at Geeks.com which is a leading electronic retail site specializing in computer-related excess inventory, manufacturer-closeouts, high-demand and unusual computer components, peripherals, and consumer electronics at highly-discounted prices to tech-savvy, "Geeky" consumers. Check 58Coupons regularly for great Geeks coupons, Geeks promotions, Geeks sales and Geeks deals for Geeks.com. Use this exclusive 58coupons.com coupon code to save 10% on all items not marked "special" from Geeks.com. Get free shipping on your next purchase of $100 or more from Geeks.com! Just use this code. Act now for the best selection of clearance items from Geeks.com. Find a laptop, GPS, Router, Cables and more all heavily discounted. Save up to 40% on the daily deal at Geeks.com. Click link to see today's steal. 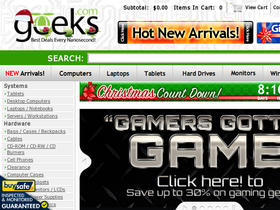 Hurry on over to Geeks.com to save 10% or more on select items with this coupon code. Save on everything not marked "special". Click to learn more. Hurry on over to Geeks.com to purchase as Apple iBook G4 PowerPC G4 1.33GHz 1GB 40GB CDRW/DVD 12.1" AirPort OS X – B for only $299.99 + free shipping with this coupon code. While supplies last.